Along with the end of summer and the arrival of fall, remember that winter is just around the corner. Once winter settles over your area, you’re going to have a difficult time preparing your home for the severe weather. Before the leaves start changing color, you’ll want to begin your fall preparations. Here are three tasks that will help to prepare your home for fall. Fall is the last bit of comfortable, moderate weather before winter arrives. Once the frigid temperatures of winter blow into your area, you’ll find that certain aspects of your home are more vulnerable to the cold than others. One of these is your outdoor plumbing. If you have pipes on the outside of your home that aren’t underground or in your basement, you run the risk of those pipes freezing during colder temperatures. A frozen water pipe can become damaged or even burst. A burst water pipe is not only expensive to repair, but it can also interrupt clean water service into your home for several days. To prevent this expensive and destructive water emergency, purchase insulating pipe foam from your local hardware store. It’s easy to install and relatively inexpensive. Insulating outdoor plumbing is a great way to prepare your home for fall. Get this task done before it gets too cold and unpleasant outside. As the colder months of fall start to transition into the freezing months of winter, your gutters will be the first area of your home to be tested by precipitation and freezing temperatures. Your roof is the first line of defense against debris and inclement weather. This means that falling branches and leaves are deflected by your roof and deposited in your gutters due to the pull of gravity and the slant of your roof. 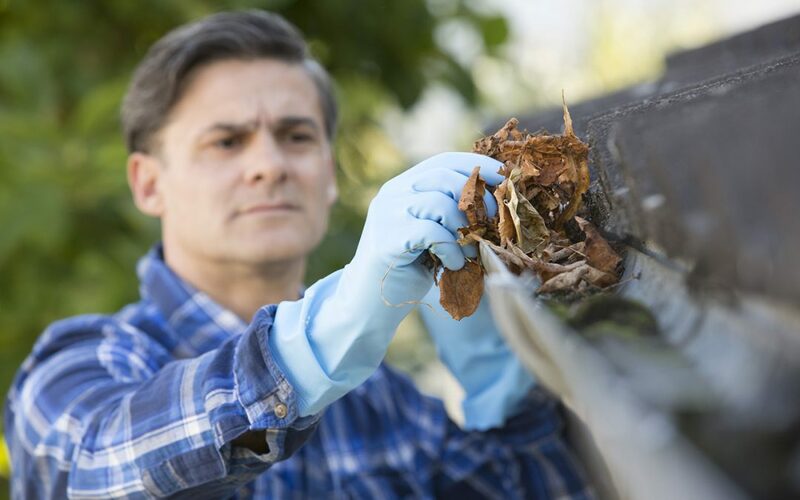 Throughout the year, debris accumulates in your gutters. As snow and freezing rain come down, this debris turns into solid chunks of ice which will become very heavy. All the extra weight on your gutters can cause them to be ripped from the roof of your house. Before this unfortunate series of events has a chance to occur, spend an afternoon during the fall cleaning your gutters of branches and leaves. This is a valuable way to prepare your home for fall. Fall is the best time of the year to prepare your lawn for spring growth. Caring for your lawn starts with a simple de-thatching or scarifying. De-thatching your lawn calls for using a blade with tines to cut through thick, dry grass. This helps remove layers of dead grass blades and dead leaves. Scarifying is essential to a healthy spring lawn because it allows air and nutrients to reach the soil beneath your grass. After you remove layers of dead grass and weeds, you should overseed your lawn. Overseeding is the act of tossing grass seeds into the soil of your lawn without digging any holes or tearing up the current layer of grass. Overseeding is best done in the fall to allow the seeds to grow strong roots during the fall and winter months so that they can support a full grass blade during spring. Prepare your home for fall by giving your lawn a last round of maintenance before it goes dormant for the winter season. Assure Home Inspection offers home inspection and testing services to the Chicagoland area. Contact us to book an appointment.